ROARrrrrr! Have you heard the news? A wild animal is on the loose, and it’s prowling the streets, scaring all the trick or treaters and stealing all the Halloween candy. Oh, wait – it looks like it’s just your little kitten in a white tiger costume that's so adorable and so sweet that everyone on the trick or treat route is giving extra treats out willingly. White tigers look and act pretty ferocious, but we all know that deep down inside, behind all those claws and teeth, they’re really just pussycats. That’s why this Wild Tiger Toddler Costume is perfect for the serious Halloween fun your little wildcat has in mind. The costume has lifelike black tiger stripes, but it’s super soft and snuggly. The teeth and claws are big, but they’re completely harmless. The hood seems like the tiger is giving a big, scary roar, but look more closely – it’s really just a great big smile. 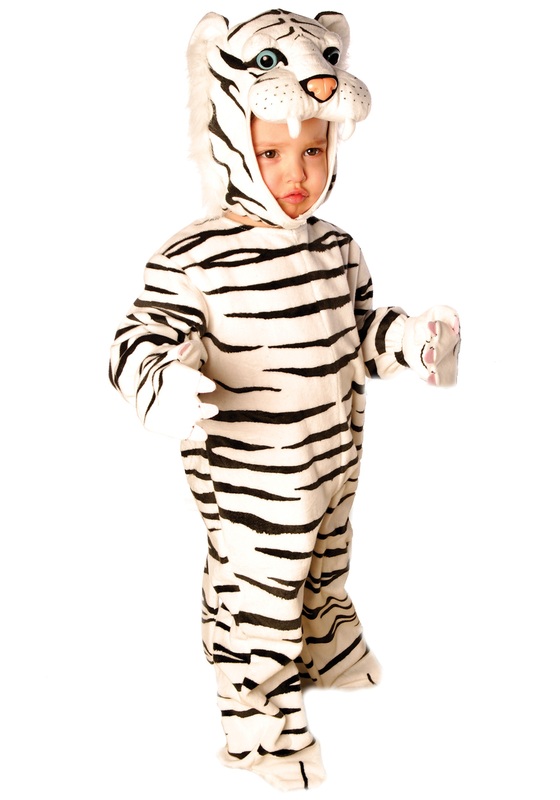 This White Tiger Toddler Costume is comfy as the cat’s pajamas, too. It’s a jumpsuit made from plush velour that fastens with Velcro so it stays in place all through the nocturnal hours. The paws are shoe covers with elastic bands underneath and mittens that have elastic to keep them on during the Halloween prowl. And the face – it’s irresistible! Soft sculpting with plastic eyes and a nose on top of the hood will have everyone in the neighborhood smiling. The hood fastens under the chin with Velcro so if a big, giant, non-kitten “ROARrrrr” happens to come out, the hood will stay on tight. 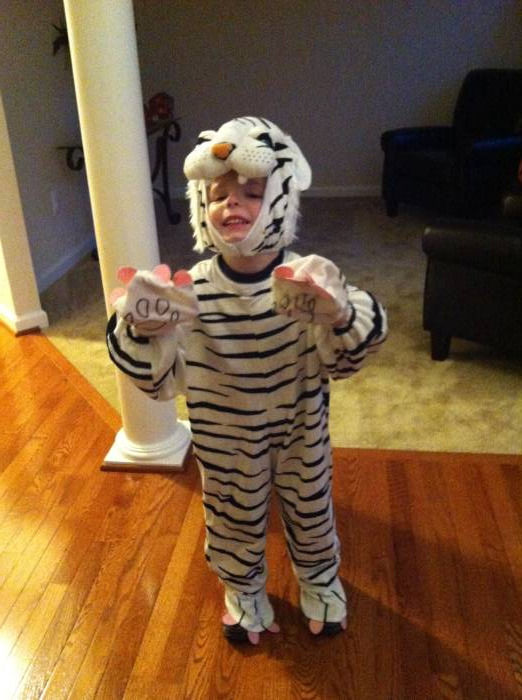 My son was so excited to wear his white tiger costume for Halloween this year. He even roared a few times. The tiger hat piece had Velcro in it & made it a little difficult for him to see.